May we all be moved by beauty today. May we all feel the passion and be moved to take flight into our dreams. A human being is essentially a spirit-eye. On this gray morning after a glorious weekend, I'm sitting in a coffee shop in Portland getting ready to go spend some time with my new adopted mom. A chasm formed last August when my second mom died. I became motherless and thought that at this stage of life, that was to be expected. It was part of my lot. 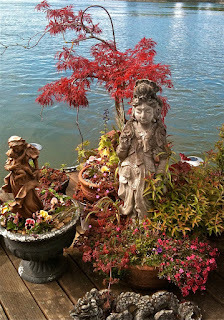 But, on Friday I met Marzenda, a water sprite who lives in Portland's house boat community ... the image here is of her front porch. Almost instantly I changed my mind about accepting my motherless condition and asked her if I could adopt her. She graciously accepted and my heart feels fuller already. So the question for today is: what else is out there waiting for us if only we look with spirit-eyes and take flight into our dreams? The world is so full of wise and generous souls. I feel surrounded, loved, safe in an abundant Universe that may send me challenges but always, if I choose to accept the lesson, as doorways to greater love. How wonderful: I love the hope and joy that sing through this post. Which Portland is this? Oh Diane, your words always touch my soul and resonate with my spirit -- my inner sprite awakens and I take flight with you. So glad to hear you've got a new adopted mother! And so glad you are safe in God's embrace. Joyce, I've been away (my son graduated from NYU) and just returned. Catching up, I found this lovely post. How wonderful for you. As Diane says, hope and joy grace this post.